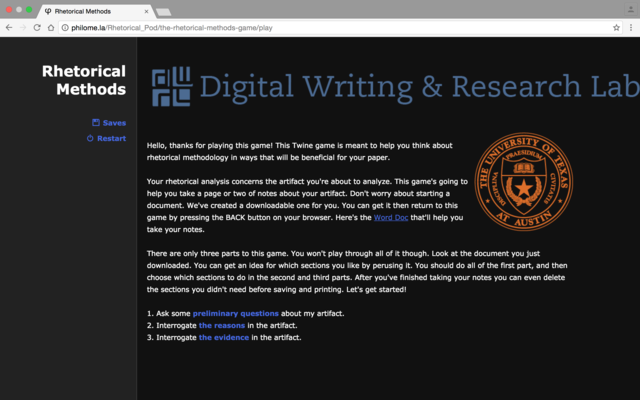 This game builds on the successes of our Twine research group, which last spring set itself an ambitious goal: Find meaningful ways to bring digital technology like text-based gaming software into the college classroom. After a lot of learning, brainstorming, meeting, and innovating, we did just that. We created a lesson plan based off of a creative exercise called a game jam! This lesson plan was quite a success. It ushers students from knowing nothing about Twine software to making their first game in the span of a class period, all while instructing students about the importance of crafting messages that are informative, pithy, and substantive. Or if you don’t need a full lesson, but just an introduction to Twine, try out my Meta Game which guides you through the process of making your very first game.